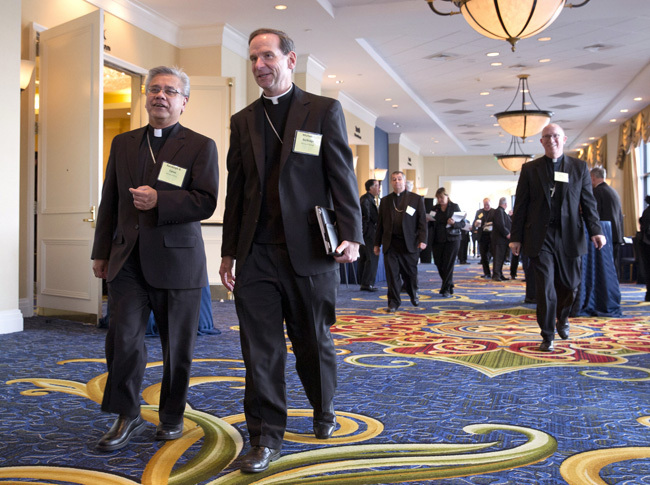 BALTIMORE (CNS) — The extraordinary Synod of Bishops on the family, called by Pope Francis for next October, is drawing great interest from everyday Catholics, many of whom are anxious to weigh in on questions the Vatican has sent out in preparation for the session. In a brief report to the U.S. Conference of Catholic Bishops Nov. 11, New York Cardinal Timothy M. Dolan said he’s awaiting clarification from the Holy See about how preparatory material such as the answers to a questionnaire sent to the world’s bishops’ conferences, will be used. In the meantime, several bishops said they are already consulting with their priests’ councils or other diocesan organizations. Bishop Robert N. Lynch of St. Petersburg, Fla., suggested the U.S. bishops create several ways that everyday Catholics can respond to the questions the Vatican posed. He suggested using a website such as Survey Monkey, for example, to solicit input, as well as have a way for people who don’t use computers to participate. Cardinal Dolan said he didn’t think it would constitute skating on thin ice to say that any bishop could rework the questions from the Vatican so that they are clear to the general public. Philadelphia Archbishop Charles J. Chaput said he has asked for the questionnaire to be made available on the archdiocesan website. “I think it will be finished Wednesday,” he added. Archbishop Chaput observed that the bishops of Great Britain have created a website to be used nationwide for people to weigh in on the questions for the synod. “I’ve had emails saying people expect to do this,” Archbishop Chaput said. Cardinal Dolan and Washington Cardinal Donald W. Wuerl, who has participated in numerous synods, bantered a bit about how the preparatory questions are sort of an antipasto before the main course of the full synod and the “dolce” or dessert course, the post-synodal apostolic exhortation that typically follows.